In a small field, just outside of a sleepy town in 1940's middle America, Martian Saucers hover in the night sky. Having chosen their first target, a large group of humans gathered around a travelling carnival on the outskirts of town, a legion of Martians march to war. But not all of the Humans are defenceless. As the crowds flee in terror and are vaporized by the saucer's deathrays, one brave group of circus performers step forward to defend their planet - Earth's first line of defence! This will be their greatest performance... and maybe their last. Invasion From Outer Space: The Martian Game is a fast-paced game of fiendish Martians, Big Top Heroes, and Sci-Fi Movie Action. Players take on the role of either the Carnival Heroes, using their special talents and working together to fight off the Martian Invasion; or as the invaders themselves, waves of Martian Soldiers and Flying Saucers, blasting Humans with Ray Guns and unleashing their vile alien technologies upon the Earth. 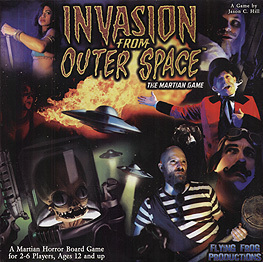 Featuring a modular game board, eight Carnival Heroes to choose from (such as the Fire Breather, Strongman, or Jo Jo, the Dancing Bear), an army of Martian Invaders (including Martian Champions such as the dreaded Zard Beast), dynamic new game mechanics and several different Scenarios to play that drastically change the game; Invasion From Outer Space is designed to create a cinematic feel as the story and game unfolds. Invasion From Outer Space is built using the Last Night on Earth game engine, so the two tames are compatible. Players can now have their Martians invade the small town of Woodinvale, Zombies attack the Carnival, or even play a massive game with up to three independent faction (Heroes, Zombies, and Martians), The possibilities are endless.